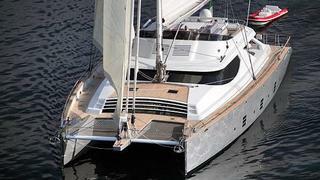 David Johnson at Denison Yacht Sales asks me to spread the word that he has reduced the price of the 32.6m sailing catamaran La Sella del Diavolo by €500,000. The new asking price is €8,500,000 and the boat is docked in Ft Lauderdale and available for viewings during the Miami Boat Show. She was designed by Olivier Racoupeau and custom built in 2011 at the NAC Shipyard in Trieste for an owner with many years of yachting experience. La Sella del Diavolo is one of the largest sailing catamarans ever built and offers a tremendous amount of interior and exterior volume for a vessel of her size. She has accommodation for seven guests in a full beam on deck master suite and two guest cabins, with ensuite heads, in the starboard hull. Crew accommodation is for five. MCA compliant, La Sella del Diavolo is asking €8.5 million.